Salah satu web server untuk windows bundle yang lumayan simple stabil dan portable. Sangat priorotas pada portable, dan flexible dalam konfigurasi. Without installation : UwAmp is available as a Zip archive, just unpack it and you can run the wamp server. UwAmp doesn't install files in the system to keep it clean. Easy interface : UwAmp is provided with a management interface that lets you start or stop the server with one click. 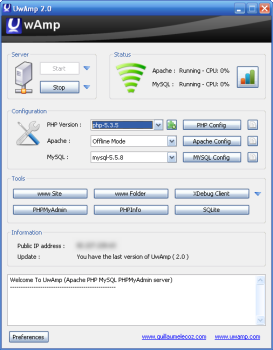 Multi PHP Version : Change PHP version in one click to test compatibility and download new PHP version directly from php.net repository. CPU Monitoring : Real time Apache and MySQL process CPU monitoring. U3 Mode : Can be run from a USB stick. Web servernya bayar berapa per tahun nya gan ? (19.08.2016, 14:34)rapidash Wrote: Web servernya bayar berapa per tahun nya gan ? Itu diatas bukan untuk web hosting, tapi untuk develop web aplikasi jika kita menggunakan windows. idea yang hebat, saya juga benar-benar memerlukan panduan kecil! Current time: 19.04.2019, 23:55 Powered By MyBB, © 2002-2019 MyBB Group.